On this weeks podcast, Colin Fox on the launch of the SSP manifesto this week, Don Mackeen on the upcoming American presidential election, podcaster Michael Greenwell in the first of a series of interviews he is doing for the SSP, Katie Bonnar on the dreadful kidnapping of young women by Boko Haram in Nigeria, Stephanie Rolls on the Scottish service tax and Calum Martin on the rebellion of 1820. 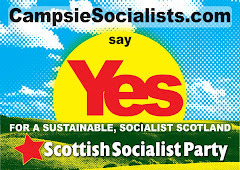 Get in touch with us via the website www.scottishsocialistparty.org or email me directneilwscott@hotmail.com we want to know your views on our policies, the podcast and I am wanting to hear from unsigned and independent bands who would like to have their music played on Scotlands most popular socialist podcast. On Scotlands most listened to socialist podcast, SSP Glasgow East candidate Liam McLaughlan on his election campaign, Singer song writer,Joe Solo on his support for the miners and the mining communities, Jenni Gunn on remembering the conscientious objectors, SSP co-spokesperson, Sandra Webster on the 1 in 5 campaign, Beinn Irbhinn on the language of the left and socialist democracy, SNP socialist, Debra Torrance on her choice in the election (and the POLITICAL COMPASS), and Calum Martin will be continuing his delve into the history of the left. In today's podcast (on the day Scotland saw an eclipse of the sun! ): Allan Grogan, co-founder of Labour For Independence and now SSP, talking about how the SNP majority council through in Dundee is now letting down the majority working class yes voters; Ron Mackay on the increasing danger of nuclear war; Calum Martin on how Scottish Politics were changed by the French revolution; Beinn Irbhinn on splitting the Yes vote and Hollie Cameron on how social media and the main stream media may be putting off powerful political women from coming to the fore. We have music from Scottish bands The Cundeez and Button Up, Joe Solo and Lead Belly. I AM HERE AS THE ACCUSER, OF CAPITALISM DRIPPING WITH BLOOD FROM HEAD TO FOOT. Don Mackeen on the recent history, sociology and politics of the mainstream media. 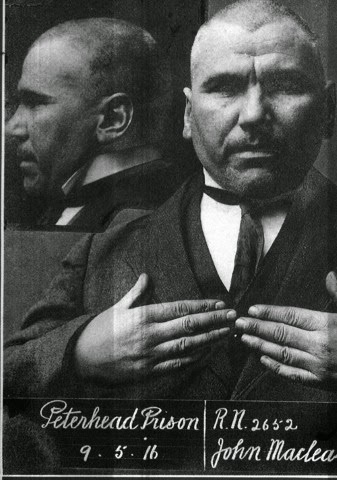 Calum Martin continues his journey through left wing history today with a piece on the first French republic. And Neil Anderson brings to life John Maclean’s famous 1918 speech from the dock. It seems that its not only the teenage mutant ninja turtles that developed an affinity for pizza, but also our very own MP the bold Jo Swindon who salivates at the prospect of a delivery from the Dominos man. However in her case its not a wee margarita or four seasons but a bundle of fivers still piping hot delivered all the way from the treasure island of Jersey. In the last year oor Jo has received ,in two installments, £8 500 from Brompton Capital, yes you guessed, it's the company that made its fortune bringing the Dominos pizza franchise to the UK. The company's owner Rumi Verjee who has an estimated worth of £125m has been throwing his dough, so to speak, at parliamentarians for some time now. The main beneficiaries being the lib dems £770k in all. Curiously he has also gifted plebgate minister Andrew Mitchell a cheeky wee £11k. The surprise outcome of this was of course. A lib dem peerage. Not bad for a guy whose company apparently employs no one and fails to turn over a profit in the UK. Although his dealings have been cleared by the Electoral Commission the question our Jo has to answer is. Is she comfortable professing a purge on tax avoiders whilst filling her election kitty with this man's dubious donations. Watch out for the next course, will Jo come clean and display the corporate roof sign of the pizza giant on her election vehicles or can the electorate be enticed to the ballot box by a free portion of cheesey garlic bread. GARLIC BREAD. THE DIRTY BASTARDS. NATO is an aggressive, nuclear armed military alliance under U.S. Control. I read Professor Tyler Cowan an economist at a U.S. University said a big war is needed to settle the economy. Amazon recently displayed a book -”Winter Kill – war with China has already begun “ There have already been 2 Wws essentially caused by economic problems. Are we to have a 3rd. The winners in the first 2 WW s were the U.S. Bankers and arms manufactures. We are 20 mls. From a nuclear arms dump. I'm a long standing member of CND (google Ron Mackay and his peace activism and you'll find me on U tube). I've been against nuclear weapons since the first one was dropped on the 6th.of August 1945. The planet is in its most dangerous situation ever. The present generation has the power to change life on the planet or to destroy all life on the planet. Many eminent individuals are warning that the situation is extremely serious. Naom Chomsky, John Pilger, Michel Chossudovsky and many others have voiced their concern. We've had 2 world wars caused essentially by economic problems. The big capitalist powers have serious economic problems. Has there to be a third world war ? The signs are ominous. The Westminster warmongers are spending £ billions, not just on trident and other nuclear weapons but on huge military projects. The US policy of perpetual war which our defence “experts” slavishly follow throws a heavy burden on the welfare state. Warfare and welfare are incompatible. The media plays a significant part in promoting war propaganda . It is a powerful opponent of the peace forces. 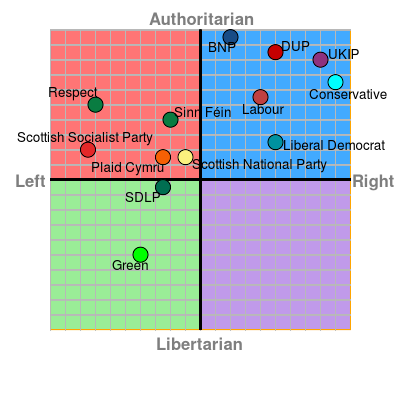 We badly need a strong active socialist peace movement which can accommodate the socialists in the LP, in the SNP, in the Greens, in the SSP , in the CP and all the other socialists some of whom are in no political party. 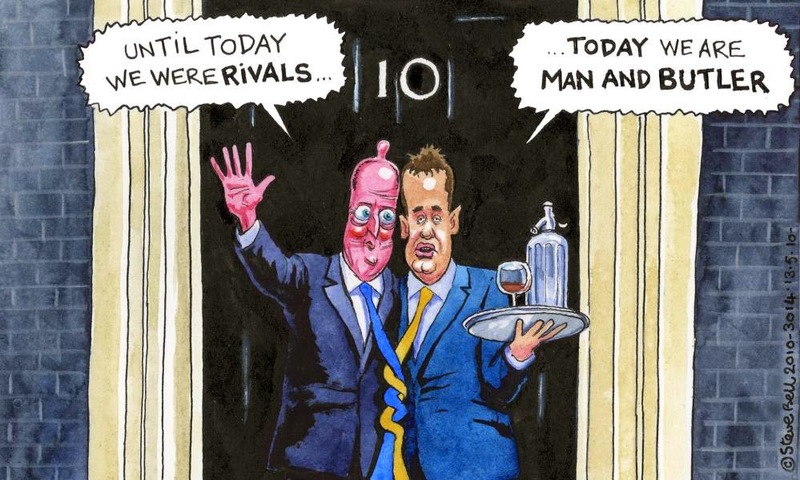 We have much in common not just peace but anti-trident, anti-austerity, green issues etc. This need is urgent and vital. This matter should be raised at every meeting held as we approach the elections. Cat Boyd from the ISG will be giving her view on left unity and in particular on the Scottish Left Project. Hollie Cameron tells us about a major SSP victory in Stirling University. Richie Venton SSP's national workplace organiser and regional organiser for the West of Scotland on the SSP’s reaction to the austerity budgets set by Councils across Scotland and what the we propose instead. 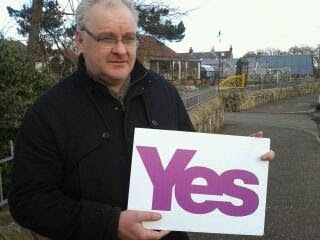 And Gerry Mulvenna will be explaining how a growing group of volunteers are “televising” politics throughout Scotland. 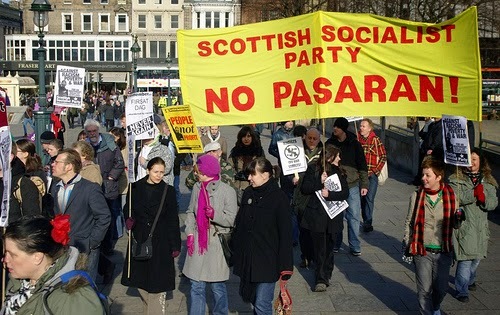 This week on the SSP Podcast, we have members from SSP Glasgow Central Branch on Zero Hours Contracts; wages in the NHS and Don McKeen with an invite to what sounds like a really interesting talk at the Yes Bar - details on Facebook HERE, Jenni Gunn speaking about every day sexism, Beinn Irbhinn on aspects of our socialist language, Wendy MacDonald on the SSP policy of the citizen’s income and as the SSP does not claim to have a monopoly on socialism - Debra Torrance from the SNP on sustainable energy and hot tubs! The Music this week is really exciting. We have tracks by David Rovics, James King and the Lone Wolves, local band TravelCat whose twelve Bar blues you can hear in the background, folk rock singer songwriter Suzen Juel, Milton Star and an exclusive track from Socialist R&B band, Thee Faction from their new album, Reading Writing Revolution, which is still being recorded. Promoted by Jim McVicar on behalf of the Scottish Socialist Party. Suite 370, Central Chambers, 93 Hope Street Glasgow G2 6LD. Acting Strange Radio - click on episode to hear! Edinburgh University In Occupation! » NICK CLEGG IN EDINBURGH TOMORROW: WE WILL MARCH! Scottish Parliament - West Region - Election Results. S.S.P.